As our planet slowly heats up, more and more people begin to have their own personal account of how natural disasters have affected their lives. 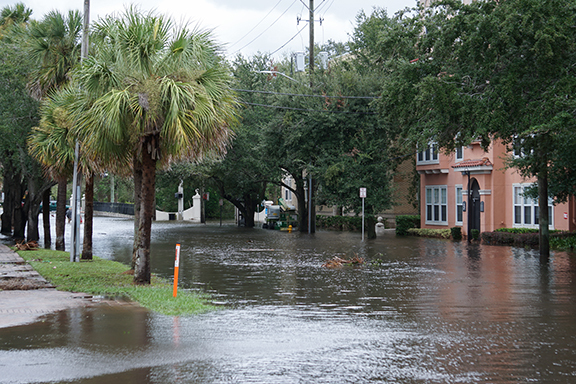 Flooding is one type of natural disaster that is affecting more areas and causing more devastation than ever before. When flood levels begin to rise and precipitation increases, homes and businesses around the world become increasingly at risk. There is a way, however, that people can prepare for natural disasters before the storm ever appears on the radar. Climate adaptive design prepares buildings starting from its design phase for natural disaster. Since 1958, there has been a 71% increase in intense precipitation and by 2080, today’s 1% flood will occur six times more frequently around the world.1 By 2100, sea level rise could flood over 1.9 million homes in the United States. 1.8% of the housing market will be affected if sea levels rise by six feet, and those properties are valued at $916 billion dollars. Many coastal cities could end up under water as well.2 Architects and designers can design their buildings with the future in mind, so that their buildings can withstand climate changes that may threaten communities around the world. Building design meant to withstand climate change begins with location. Ideally, buildings would be constructed out of the flood plain. Since that is not always possible, it is important to raise houses well above the flood plain. Instead of using current flooding data, plan for the flooding that may occur twenty to thirty years in the future. Homes can also be floodproofed in different ways. Some architects prefer to use wet floodproofing, which uses vents that allow the water to move in enclosed parts of the lower area of a home or office building, like a crawlspace. Once the water recedes then the vents allow the water to move back out of the home. Buildings can also use dry floodproofing. This method makes a structure watertight by sealing walls with waterproof coating, and then adds pumps to get any water out of the home. Site perimeters like barriers can also protect buildings from flooding, as well as elevating the living space in a home. Architects and building designers have also been experimenting with innovative designs such as floating buildings. The idea of living and working on water, though, has been around since ancient Greece and the city of Mesopotamia. There are floating houses being built on Lake Huron that have been designed to withstand significant water level variations associated with climate change. Steel pontoons are used to allows the homes to move with the lake.3 More and more houses are also being built on stilts so that they can survive intense flooding. Climate adaptive design can be used for more than just flooding as well. Homes and businesses can be designed to protect their inhabitants from multiple climate related disasters. In case of power loss, stairwells can use daylighting which would allow people to safely exit the building even if the building lost power. Properties can also optimize their use of onsite renewable energy, and only back up the critical load with a generator. Water supplies and water storage can also be implemented through wells with hand pumps and by harvesting rainwater. Composting toilets and waterless urinals also benefit building occupants if running water is lost during a natural disaster. It is important to design buildings for the area that they are located in. Vernacular design is architecture based on local needs, local materials, and local traditions. When buildings are designed for local nature patterns and use local resources, they will use less energy. Buildings should also use products and materials that will not release any gases or leach hazardous substances in case of a fire or a flood.4 When buildings are designed with the future in mind, they can keep their inhabitants safe in any weather.